Kenyan athletes will kickstart their event at the Rio Olympics on Friday under a dark shadow after team manager Michael Rotich was sent home following bribery allegations. Kenyan police have arrested Rotich in Nairobi. A report released on Sunday by the British newspaper, the Sunday Times and German broadcaster, ARD, alleges that Kenya's athletics team manager, Michael Rotich, solicited bribes amounting to $13,000 (KSh 1,325,180). The investigation, carried out between January and February this year at a training camp in Iten, in Rift Valley, Kenya, alleged that Rotich offered to warn undercover journalists posing as athletics representatives, when drug testers from the world Anti-doping Agency were going to visit. In the video recording released by the German broadcaster ARD, Rotich is seen telling the investigators that he could easily get the dates for the drug tests and pass on the information to the undercover journalists. It was not too long ago that Kenya was scrambling to get out of the list of non-compliant countries of the World Anti-doping Agency (WADA). The government managed to pass the non-doping laws in compliance to WADA requirements. And it was only last Friday that WADA confirmed that Kenya was compliant. But this new report threatens the already shaky situation. The report was released barely a week before the athletics events start this Friday. While speaking to DW, Warothe Kiru, a Kenyan sports journalist explained that people believe there may be a vendetta being pushed against Kenya given that it's just a few days before Kenyans get into the Olympics properly with the athletic events. He also expressed concerns about the possibility of Michael Rotich being set-up. Rotich told reporters that he was acting undercover to unearth drug cartels run by foreigner in the country. All this action comes after athletics coach Claudio Berardelli, and two Kenyan doctors were charged last week in a Kenyan court. They are accused of administering EPO, a banned performance-enhancing drug on former Boston and Chicago marathon champion Rita Jeptoo. The three pleaded not guilty and they were released on cash bail. Team Kenya athletes are facing more management challenges as Sunday morning saw world javelin champion Julius Yego stranded at the airport in Nairobi. He was traveling with the third batch of Team Kenyan athletes only to be stunned by the news that there was no ticket for him from the National Olympics Committee of Kenya (NOCK). But Yego was not the only one traveling to Brazil. According to reports, world 1,500m silver medalist Elijah Manangoi and two-time world marathon champion Catherine Ndereba who is also Team Kenya chaperone also failed to get their tickets. 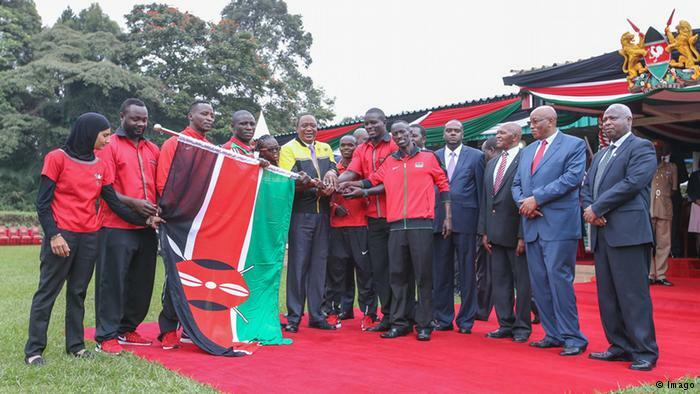 This led to a protest by the rest of the Team Kenya athletes who refused to board the plane. The NOCK officials, led by Team Kenya CEO James Chacha, held talks with Kenya Airways, the national airline, which allowed the three to get a boarding pass up to Luanda in Angola. This created a social media outcry that saw Yego and his teammates sorted very fast. Meanwhile, in another official blunder, US-born Calvin Nkanata has been withdrawn from the Rio team. Nkanata holds an American passport, but he lacked a Kenyan Passport that is required to compete in the Rio Olympics. Kenya's constitution allows for dual-citizenship but the officials never issued one to him. Kiru says these cases are just incompetence on the part of the NOCK. Sports and athletics are some of the main things that unite Kenyans and they have been taking the news bitterly. And they seem to be unanimously condemning the corruption and doping allegations and the mismanagement of Athletics Kenya. Others have called out the government officials who are well catered for in the Olympics while the Athletes, who actually win the medals, remained stranded. Since the beginning of this year, there has been a shake up in the officiating body of athletics in Kenya. The president Isaiah Kiplagat, vice-president David Okeyo, former Treasurer Joseph Kinyua and CEO Isaac Mwangi. After the release of this Report, the International Olympic Council confirmed in a press statement that Rotich was recalled from the Rio camp as the Anti-Doping Agency of Kenya examine and validate this new allegation. Now, the Athletics Kenya management has taken to twitter to set the record straight on who is to blame on the chaos of the Kenyan team in Rio. It may take some time before the doping cloud and bribery allegations slide away from Team Kenya Athletes. But Kiru says that these challenges are a sign of the resilient Kenyan spirit.